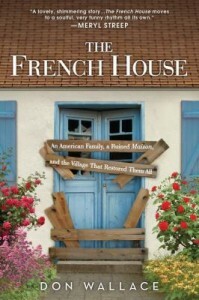 This is a charming narrative of a family claiming a piece of a beautiful French island for themselves. Don Wallace‘s description of the natural beauty of Belle-Ile makes you want travel to this remote island and climb the cliffs to the beach. Despite the fact that Don and his wife Mindy are just barely scraping by in New York City, they decide to buy a ruined house in a small village on Belle-Ile. Repairing it enough to make it inhabitable takes 8 years and multiple trips to the island. There are ancient village rules for building a sane and moral house that take some serious negotiating. Wallace relays the bonds they form with the village neighbors, his struggle with the French language and their love of surfing with a humorous touch that make The French House an enjoyable read. Caputo, his wife, and his two hunting dogs travel from the southernmost to the northernmost point of the U.S. trying to answer the question: what is the glue that holds Americans together? We are such a diverse people spread out over such a diverse landscape from sea to shining sea. Historical trivia, local color, and a few laughs follow Philip Caputo on his long trip. It’s all in the journey, not the destination. Also, it is a very personal journey. Each one of us could write a very different memoir about the same trip. I anxiously await my opportunity. The Longest Road is the 2014 Big Read selection. Find discussions, programs, and author visit information here, he’ll be at Ashton Place on May 1. Although some reviewers see Walker as too bubbly and unaware of the basic scientific understanding her readers are likely to have, I very much enjoyed reading this book. The author takes us on a tour of Antarctica describing the various scientific projects from penguin behavior to ice core sampling and meteor hunting. She allows us to visit both the east and west lobes of the continent with some details of where the ice sheets are retreating and how it might affect the rest of the world. Also, there are brief episodes of the historical heroes given as the narrative moves around the continent as well as interesting tidbits of persons spending successive winters at the South Pole and the first natural born citizen of Antarctica. Try reading Antarctica in the dead of winter to set an appropriate backdrop for the narrative. Excellent mixture of a 1990s trip to the southern tip of South America with tales of past voyages, beginning with Magellan through missionary journeys in the early 20th century. The stories bring in current friction between Chile and Argentina as well as conflicts among the English, Spanish, and the Aborigines in Terra de Fuega. These adventurous explorations leave a salty taste for all of us would be sailors. Start your adventure with Rounding the Horn by Dallas Murphy today! Shakespeare professor (as Mary Bly) and romance novelist Eloisa James takes a yearlong sabbatical and moves from New Jersey to Paris with her husband (Alessandro, a professor and an Italian knight) and two children (Luca, 15 and Anna, 11). It’s difficult to describe this book. It’s a memoir. A travelogue. A love letter to the City of Light. A chronicle of everyday family occurrences. But it’s done in such a way that draws you in and makes you feel as if you’re there alongside Eloisa and her family in Paris. Anna will steal your heart. The antics of Milo, the family dog, will leave you chuckling. The book grew out of Facebook status updates posted during her year abroad. Each chapter starts with a brief essay and is followed by short vignettes. Some are only a few sentences long; others are lengthy paragraphs. It works. The writing is eloquent and witty. Although the format lends itself to reading in short spurts, you won’t want to put this book down! Read Paris in Love today! Also check out a TIME Magazine interview with the author about her famous parents, her writing life, and her decision to move to Paris. Watch the author and her husband discuss the book and see some of Luca’s snapshots of Paris in this YouTube video. Blowback is the fifth book in the Enzo Files series. May continues Enzo’s quest to solve seven cold case murders. To really appreciate this book, you need to begin with Extraordinary People, the first book in the series. That being said, May produces another absorbing mystery. This book takes us to the world of the three star Michelin restaurants in France where we begin to realize the dark side of the culinary arts. If you like food and France and an interesting older man with plenty of appeal, you will enjoy this book. Another point of interest is the ongoing story of Enzo’s personal growth in his relations with family, friends and, being Enzo, his lovers. Check out the authors favorite recipes. A small book to get a quick insight into Africa. Bryson writes with his usual humor about traveling through Africa and what his preconception of Africa was before his trip. Bill Bryson’s story about Africa contains wonderful pictures and explanations of the continent. The profits of the book go to CARE to benefit African people. Check out the official Bill Bryson website and read reviews on Amazon.com. A memoir about an American college professor and her lover who purchase a deserted villa in Cortona, Italy, and attempt to restore it to its former glory; thus, enabling them to enjoy “la dolie vita.” Along the way they learn to deal with the idiosyncrasies of the local workmen and the slower paced Italian way of life. Much different than the movie, I liked the book more. An added bonus is the recipes she includes. Read reviews and a summary of the book at BookBrowse.com. You can alos explore the book discussion guide. Moon takes a 5,000 mile journey by a small 22 ft. boat he put in at the Hudson River in New York. He travels the inland rivers he mapped from travelogues of past river travelers. The many rivers Moon travels are amazing to read about knowing that these rivers were traveled and uncharted until Lewis and Clark and other trappers went west. The travel by Moon and his small crew details the geography and rivers which make it possible to end up at the Pacific Ocean. Good read for people interested in someone traveling the rivers’ routes from Atlantic to Pacific in the 21st Century! Before you visit the library preview the book and read an interview with the author at Powell’s.com. Author Eames is in Aleppo, Syria, when he hears a reference to Agatha Christie coming regularly to Aleppo to “have her hair done.” Knowing nothing of Christie’s first visit to the Middle East and her many subsequent trips with her second husband, an archeologist, Eames reads up on Christie and the history of the paths of the Orient Express and Taurus Express that took her on her original trip. The book is full of the trials on traveling by train in the twenty-first century, the many interesting people along the way and the often fascinating history and culture of Eastern Europe and the Middle East. It will make you want to come right back to the library and check out the books (or see the DVDs) of Murder on the Orient Express and Murder in Mesopotamia.